This feature appears in the Aug/Sep 2015 issue of COMPLEX. When Ben Haggerty approaches, he seems sheepish and awkward, if not tentative and searching. As he walks into the small, low-­key Ethiopian restaurant in Seattle’s Central District, it becomes clear that everyone here respects his privacy and his celebrity as the professional rapper Macklemore in equal measure. The patrons acknowledge him with a warm familiarity; one of the waitresses teases that her daughter recently saw him on TV rapping about garbage with Oscar the Grouch on Sesame Street. Earl—a tooth­-impaired, middle-­aged brother who’s seen better days—chats him up and sits down, until Ben informs Earl that there’s an interview about to take place. It was Tricia’s pregnancy that served as a catalyst for his new sobriety. “I’ve been trying to grow up this year,” he says. “Since I heard that Tricia was pregnant, I was like, I need to grow up right now.” He says he hasn’t purchased any indulgent items in seven months and spends the better part of his mornings dedicated to self-care, with a routine of meditation, yoga, journaling, and attending meetings—before he starts engaging with his responsibilities as an artist and business partner. “I’ve gotten back to what makes me happy,” he says. “Not in the immediate moment, [but] what’s going to make me happy in the long run. None of the money, the fame, the attention, the touring, the endorsement, the Jordan shoe, the TV appearances—none of that, literally none of it, comes close to the fulfillment and gratitude that I feel showing up to a meeting and being sober today. Yes, Macklemore is a white rapper. And he’s the first rapper to successfully dominate the commercial sphere by speaking from a purely white gaze—unlike Eminem, who correlated his poor white trash bona fides into a sense of underdog alienation that resonated with black culture in America and leaned heavily on the tropes of blackness in rap. Zach Quillen—Macklemore & Ryan Lewis’ manager and ostensible label head—is giving a tour of Macklemore LLC’s headquarters, situated on the waterfront in Seattle. Macklemore LLC—which is a joint partnership between Ben and Ryan—is not a typical label in any sense. “It operates as a label, but it’s not.” Ben says. “We haven’t had to go hire some big shot to turn profit for our company. So, it’s like, let’s keep the team we had when we were in 500 cap venues. And everyone’s grown into their position and evolved and adapted and we continue to push the envelope of what it looks like to be a mom-and-pop business pushing music to the world.” Quillen, a former booking agent for The Agency Group, is listed simply as a manager, but functions more as a CEO—under his purview are the day-to-day operations, including licensing, branding, and interfacing with retailers and Alternative Distribution Alliance, Macklemore LLC’s Warner Bros.-owned distributor, which also handles Fool’s Gold, Matador, Tommy Boy, and many other indies. Radio promotion (which is handled by Warner Bros.), publicity, and non-essential finances are outsourced. “We’ve essentially built a traditional label, but by outsourcing the individual pieces on a work-for-hire basis,” says Quillen. The strategy, mixed with their real life and online grassroots ethos, is what enabled Macklemore & Ryan Lewis to bypass the appointed gatekeepers and the hype machines of the music industry three years ago—there’s a full-time staff of about a dozen people dedicated solely to their creative careers and philanthropic ventures. But since their quick and unprecedented ascension into the pop stratosphere, the two are no longer faced with the advantages of being long shots, and are burdened with the expectations of thriving in the current cultural space that feels at once limitless, new, and exciting—but also claustrophobic, redundant, and boring. Even with all its change, music remains the one branch of the entertainment industry where the populist approach is praised and lauded. While TV may give begrudging respect to the advertising power of reality shows and sitcom fodder, and Hollywood will always acknowledge the power of blockbusters, the properties with the biggest marketplace footprints aren’t necessarily held as the epitome of the form—unlike the way poptimist criticsm celebrates artists like Taylor Swift, Beyoncé, and Drake. 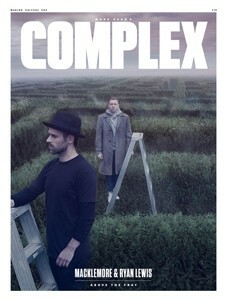 Buy Complex's Aug/Sep 2015 Issue Now!